The unsolved murder of Cheri Jo Bates on October 30th 1966 has now passed the half-century mark, and little in the way of new evidence seems forthcoming, despite a breakthrough in DNA evidence in 1999. However, the clues in this case may lie extremely close to home. Her brother Michael Bates, one year her senior, was convinced that Cheri Jo Bates was murdered by somebody she knew, and the evidence appears to point that way bearing in mind the specific targeting of her Volkswagen Beetle and the apparent knowledge of her whereabouts that evening. Michael stated to Inland Empire Magazine "I’ve always felt that Cheri was killed by someone she knew. She would not have walked into a dark alley with a stranger". Cheri Jo Bates was afraid of the dark. Bearing these factors in mind, it could have been somebody connected to Riverside College, her inner circle, or somebody who she knew loosely through her family members. Cheri Jo Bates was described as outgoing, friendly and always prepared to help people in their time of need. Cherie Curzon recalled such an occasion "For me, the best part of our story was, I was an underclass person who she wanted to help out. The people who were going to do the talent contest with me backed out and she volunteered to be my partner. I will never forget her kindness… We had so much fun rehearsing and then performing, I loved her generosity and kindness toward me…She did it because of who she was; just a wonderful person". Source. This is an admirable quality, but was this kindness misconstrued by someone who ultimately fixated on Cheri Jo Bates. An interest that developed into a deadly obsession and possibly stoked by rejection. This would certainly be nothing new. Whether or not this crime was committed by the Zodiac Killer has literally raged for as long as the crime itself. The Zodiac Killer would effectively lay claim to the Cheri Jo Bates murder on March 13th 1971 in a letter mailed to the Los Angeles Times. His reference to "they don't bury me on the back pages like some of the others," appears to suggest he followed the headlines down south, and a likely affiliation with the area and to the newspaper. The Department of Justice report described the heel prints at the Cheri Jo Bates crime scene as "those worn by Air Force personnel" and "was identified as a B.F. Goodrich waffle design, men's four-eighths inch washer type half heel. The B.F Goodrich Products Division of Akron, Ohio, reported that this type heel is only sold to the Federal prison industries at Leavenworth, Kansas. It was subsequently learned that Federal prison industries made low quarter military type shoes and supplied them to all the armed services using black dress shoes. The measurement of the heel indicated that it would have been attached to an eight to ten size shoe. Shoes bearing the same type heel were issued and sold at the PX at March Air Force Base in Riverside" In fact, the Riverside Police Department would sum this up by stating "Physical evidence found at our crime scene indicated that heel prints found by the body were made by a heel that was manufactured for military and other government agencies, including prisons". ​It was speculated that bearing in mind Joseph Bates' profession, and the fact he was addressed personally by the killer, that the murderer of Cheri Jo Bates may have been a friend or work colleague in the Naval Ordnance Laboratory of Joseph Bates, who was either familiar with Cheri Jo Bates or had crossed paths with her. The military boot print gives us a link, along with the fact the killer may have been on the fringes of Miss Bates' circle - in that he knew her - but they weren't necessarily friends. If the author of the 'Confession' letter was telling any semblance of truth, then the wording "I then offered to help. She was then very willing to talk to me", suggested that she only talked to him after the offer of help, likely implying someone less than a very close friend. The area of Corona where Joseph Bates worked was in close proximity to many naval facilities, as well as the California Rehabilitation Center Prison, both situated only 15 minutes from the location of the murder. 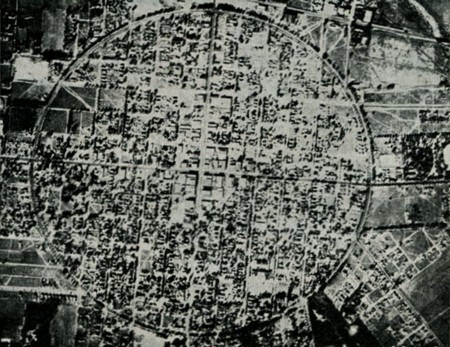 This crafted the idea that the inspiration for the Zodiac crosshairs was based on his first murder in Riverside County, and Corona (the Circled City) itself. This is an aerial shot of Corona today, but was once perfectly symmetrical. Michael Bates was in the Navy at the time Cheri Jo Bates was murdered, but did he have friends in the military, or aspired to be in the military that may have crossed paths with his sister in the preceding months of her murder. Somebody that may have left the B.F. Goodrich heel print in the Riverside alleyway. "It was subsequently learned that Federal prison industries made low quarter military type shoes and supplied them to all the armed services using black dress shoes". Michael, by his own admission spent limited time with his sister before he joined the Navy. He did however work at Sears Department Store while attending the Riverside City College. In 1938 Sears would relocate to Seventh and Main Street, Riverside, where the building can be found today. Sears is short for Sears, Roebuck & Company. ​Did Michael Bates have a work colleague from Sears, who may have sourced his material from the department store, and somehow became interconnected with the movements of Cheri Jo Bates. The Sears, Roebuck & Company has a distinct connection to the Lake Herman Road murders on December 20th 1968. In the Department of Justice, Bureau of Criminal Identification and Investigation, conducted by David Burd, the firearm identified as the likely murder weapon at Lake Herman Road was a J C Higgins 80 pistol. The Sears, Roebuck & Company specialized in sporting goods and recreational equipment between 1908 and 1962, with the Sears JC Higgins eventually replaced with the Ted Williams brand. The Sears, Roebuck & Company manufactured their own paper targets throughout the 1930s, 1940s and 1950s, the very targets a young Zodiac may have used. The above target suggested "For best results with .22 Long Rifle". Whether or not the Cheri Jo Bates murder on October 30th 1966 or the Lake Herman Road murders of December 20th 1968 were the Zodiac Killer's first, the crosshairs loomed ​​large over both. Hi Richard. Stop me if you've heard this one. In the letters the Riverside killer is rejected and one could say broken-hearted. Have you ever interpreted the Bates symbol as an unconventionally represented broken heart? The top of each looks like a lower case m. If the bottom strike was angled in like a V rather than out like a Z, I think it would form a proportional heart shape. No, I have never heard of that before Drew. It's certainly in line with the tone of the letter. If one of the images was flipped 180 degrees and superimposed over the other using the m as the central portion, it would form a heart, with a curve underneath, like so. But probably, like you, it doesn't seem like a Z when blown up. Unless of course it was written on an uneven wooden Riverside desktop? That is an interesting theory, that he wrote the Bates letters on the Riverside desk. It would certainly account for the crudity of the otherwise carefully composed big cap lettering. Add the cut RCC library paper stock idea for the confession letter and the Riverside killer seems more and more like he was from the Bates inner circle. Thanks for the graphic, it illustrates the idea perfectly! If we consider Cheri Jo Bates being murdered by somebody relatively close to her, or somebody who knew her, just by sheer numbers, her Riverside City College fellow students would be top of the list. The Bates letters used the same size paper that the Riverside library photocopying machine took. The cropped Confession letter indicated concealment of the identification of the paper. If not college paper, then something that could potentially link the source. The Riverside desktop writing, if Zodiac or the killer, may indicate further affiliation to the library or college. The personalized letters to the Chief of Police, Riverside Enterprise and Joseph Bates is telling. The Goodrich boot impression, bearing in mind the naval bases in the area, could indicate the killer worked locally, if not the author of the letters and desktop poem. The Confession letter and Bates letters 5 months apart, could equally suggest a local connection. Tie all this to the specific targeting of the Beetle and apparent knowledge of her movements on October 30th 1966, it certainly appears like the Riverside College and the Navy could both play a part. Michael Bates was a student at the Riverside College, then he joined the Navy. If Michael had a friend who followed in his footsteps or vice versa, then this friend may have become loosely acquainted with CJB. Fingerprints taken from all present students at the college would not have eliminated him, as he may have left the college the previous year or so, but still had familiarity and access to it. I cannot believe for a minute, the person or persons responsible for the crime is a complete stranger. It seems extremely personal to me, and I've seen enough Joe Kenda's. One case I find extremely interesting is the JonBenet Ramsey murder. When you hear the enhanced telephone call, and combine it with the three page ransom note, it's telling. I don't know if you've seen it on Youtube Drew, but this two part documentary is intriguing viewing. Other than the ransom note you posted recently I've never studied the Ramsey case, but I will definitely check out the documentary. The profile of a connected but not too connected Riverside attacker explains both the personal nature of the crime and the criminal's confidence. I too think that is correct. I still don't understand the killer's evident confidence that the VW print wouldn't get back to him. Maybe he was wearing airplane glue. If Zodiac was responsible, or even just knowledgeable and inspired enough to emulate the approach, it sends me back down the rabbit hole of considering that Zodiac knew at least some of his victims and sent their families taunting breathy phone calls. I think Zodiac was a man on the move at least on weekends and may have been more social than generally believed. Within the canonical Zodiac victims we can see that Zodiac is learning from past mistakes. The explicit connection the Riverside killer drew between the victim and himself may have seemed like a risk he didn't want to incur after deciding to go on a killing spree as Zodiac. Sandy Betts has a theory that Zodiac worked construction and I think Howard Davis has similar thoughts regarding Riverside. I have been intrigued by this in connection to the four men in work shirts who saw Cheri Jo by her VW. From your discussion with Ray on those guys I am guessing that nothing more has been learned about them. I have a rather silly postscript theory here to consider linking the desktop poem. If you flip the bottom "n" portion of the "h" and creatively shimmy it up a bit it would look kind of like the Bates symbol. It is possible the fingerprints retrieved from the Volkswagen are not the killer's. Who else had contact with her engine in the recent days or weeks prior to her murder, who may have deposited those fingerprints. The hair sample at the base of Cheri's right thumb or any fingernail scrapings are a different matter mind. The Ferrin phone calls are one of the more mysterious elements of this case. If it was the Zodiac, then it would appear he has intimate knowledge of the family. The police seemingly didn't follow through on this avenue of investigation nearly enough, because the proximity of these three phone calls just 50 minutes after the 12.40 am call to Nancy Slover seems less than coincidence. If the Zodiac Killer shot Darlene Ferrin, then made these three phone calls just 90 minutes later, this would obviously indicate he knew the identity of Darlene Ferrin prior to the murder, or where her family lived. When Zodiac made the first Blue Rock Springs phone call and the Napa call, he wasn't shy in owning up to both crimes. Here however in the 3 calls he was noticeably shy in speaking. Did he fear that Dean Ferrin, his parents and brother would recognize his voice, so only breathed down the phone. The alternative is that these three calls are just pure coincidence. But could Darlene have been targeted specifically. If she was chosen, it certainly doesn't mean all the other victims were. The Zodiac wouldn't be the first serial killer to murder somebody he knows, as well as strangers. It certainly is an avenue that is worthy of investigation Drew. That would be four phone calls within 90 minutes of the crime. Does this suggest somebody who lives locally, and where were the 3 calls made from? I am starting this thread because this issue is one that seems to get overlooked more often than not. I realize that this may be due, in part, to the sorce of this claim being 'The Yellow Book', but as far as i have been able to determine, there is a police report that states these calls were made. So, based on this, let's look at the enevnts of that night and what the calls could mean, and reasonable assumption one can make regarding them. We all know that Darlene Ferrin & Mike Mageau were shot at Blue Rock Springs on July 4, 1969. Darlene succumbed to her injuries, and Mike, dispite being shot several times, survived. On the night itself, we know that in the early hours of July 5th, at Approx. 12.40 a.m, the Zodiac phoned police to alert them to his handy work. The call was traced and was found to have been made from a pay-phone roughly 500 yards from the Darlene's home. But, around 90 minutes after the shooting, Darlene's husband received an anonymous phone call from someone who did not say anything, but was simply breathing down the phone. Dean's parents, Mr. & Mrs Arthur Ferrin, also reported that they also had received the same type of call that night. These calls were made an hour and a half after the incident, which means that no press had yet reported the story, so whoever made the calls was not doing so as a prank in reaction to reading about Darlene's death. For some unknown reason, police did not consider these calls to be suspicious. Dean Ferrin stated that police had expressed no interest in the source of these calls. Several years later, Leo, Darlene's younger brother, said he had made these calls because he was looking to buy weed and thought his sister could help. This doesn't make sense IMO. Why would he phone looking for Darlene to help him score some weed, and not say anything and breath into the phone? Surely he could have just said "Hi Dean, could i speak to my sister please?" And if he made the calls, why make one to Dean's parents to once again say nothing and breath down the phone? If the calls were placed by Darlene's killer, this would seem to imply that he knew Darlene, or more specifically, Dean and Dean's family. The theory that Darlene was somehow involved in drugs has been stated already on this site, so i'll be brief and keep this to a paragraph. If Darlene knew her killer, then it's fairly safe to assume that he did not happen upon her at BRS Park, but rather, she had arranged to meet him there to purchase weed. Mike made reference to Darlene flashing the headlights at one point and if this is true, who was she signaling, and why? This may also help to explain Mageau changing his story and claiming the shooter followed them from his house all the way to BRS. Mageau may have been concerned that if the killers identity was found out, and it was realised that the shooter knew Darlene, then everyone would ask how did the murderer know that Mike and Darlene were at BRS park that night? So he may have 'invented' the chase scenario as a cover for this to hide the fact that he knew full well that he and Darlene had aranged to meet the murderer there to purchase drugs. Lets not forget, David Faraday & Betty Lou were shot and killed on Dec 20, 1968 at an isolated spot on Lake Herman Rd. Were they also waiting to meet someone? On that very same night a drug bust was being carried out on a residence on Lake Herman Rd. Did someone suspect Faraday & Jensen had set them up and retaliate? If these phone calls were made by the killer that night, then this is the single biggest, and most overlooked, clue to who may have shot and killed Darlene. "The phone calls to Darlene’s home, the home of her parents and the home of her in-laws on the night of her murder do not prove that Darlene knew her killer or implicate Allen. Darlene’s brother Leo stated that he made these calls and police had never believed that these calls were at all suspicious or made by the killer. Dean Ferrin did not believe that the calls were suspicious or made by the killer. The stories about the calls were inflated by Darlene’s sisters and Robert Graysmith himself. No credible evidence existed to connect Darlene and her killer, and no credible evidence existed to connect Darlene to Arthur Leigh Allen." Thanks for all this Richard, I think the BRS phone calls could very well be from the killer but only if his connection to Darlene was so personal that his voice was recognizable to her family and also like with Bates he wanted to torture the family as well. He didn't call them a dead duck or anything so if it is the killer then he is both creepy and evasive. I have alluded in other posts to a suspect with a contradictory alibi in the narcotics world who had lived in Vallejo knew Darlene intimately and had a strong reason to hate Dean. This guy has just about all of the background elements associated with the Zodiac profile (military, anti-authority, hunting, occult, newspaper business, fraud, prison, insanity) and common friends have fed speculation that he kept in touch with Darlene after Vallejo. Police cleared the guy but like everyone else obsessed with a suspect that doesn't convince us! My brother and I aren't crazy enough to believe we have solved the Zodiac case but there have been more than a few whisky fuelled nights where it seemed we had! At the end of the day we recognize that there are simply too many unknowns to be confident. Your site specifically has informed us of a million variables. Phone calls and personal bias disclaimer aside, I think an overlooked possibility is that Darlene was stalked by a non-local Zodiac who did not know her but merely noticed her in her slack dress on a float at the fourth of July parade she and her sister participated in. It is not necessary that Ferrin or Jensen were involved in nefarious activities in order for them to attract the attention of a cruising predator. Though the evidence is not conclusive you don't discount the idea that David and Betty Lou went to the dance or a diner earlier that night do you? As witnesses and family member carry on with life and become disturbed, crazy, incarcerated or all three we are left with very little in the way of solid information to build on. Backtracking to Riverside, I think the background of Cheri Jo's brother is a fine place to dig if there are any avenues available. The VW print for me prompts two questions. Was a print discovered on the door or the rear hood where the culprit disabled the vehicle? I can believe Cheri Jo might leave the keys if someone suddenly popped the hood while she was inside the car. If such a specificity as 'car door print' was published before the '67 Bates letters or '71 activities letter, the idea of a cocky killer knowing he wore gloves or only touched the hood may have the confidence to come forward in such a risky manner. Again the idea of a premeditated crime leads us back to the assumption that the killer simply wore gloves. The most frustrating aspect of the Zodiac case is that we don't know at all for sure that he was responsible for anything beyond the cannon, but if just one of the outlier crimes like Riverside or Hood and Garcia could be connected it would be impossible to ignore the rest - he clearly would be the prolific murderer researchers fantasize about rather than just the attention-seeker we assume he was. I knew about the greasy prints on the hood of the Volkswagen, but the prints on the door detailed in the Chicago Tribune, I presume could have come from anybody, if indeed we can wholly rely on newspaper accounts. The phone call after BRS could be taken as an 'attack' on Dean personally, but it seems a virtually silent call was not much of anything according to Dean, who himself didn't actually believe they were suspicious or the killer. I tend to agree with Michael Butterfield on this one, in that many of the subsequent accounts by family members were blown out of proportion. We have seen this throughout the last 50 years from several eyewitnesses and police officers. If these calls happened as they did, then it's food for thought, but can we totally rely on these accounts, with family members so personally involved, likely coming from the standpoint Darlene Ferrin was stalked and therefore specifically targeted. Family members are intrinsically biased and we don't know the exact nature, or accuracy of the timing of these calls. You and I have seen countless murder documentaries, where the evidence is overwhelmingly pointing towards guilt, it's literally 99.9%. But the family members of the guilty have a completely different narrative and equally overwhelmingly believe their family member innocent, dismissing evidence, DNA and just about everything else. That is why you effectively dismiss anything they have got to say. It's understandable they don't want to believe it, but it's irrelevant to the case. Because the family members in this case are the ones reporting the phone calls, I tend to be cautious in taking everything they say at face value. Michael Butterfield stated that nobody mentioned the stalking of Darlene at the time of the murder. This came as an afterthought, helped on its way by Robert Graysmith. So probably unfairly I have never previously delved too deeply into these phone calls for that reason. But I fully understand that people may disagree with this cautious or negative approach. Cheers Drew. "that is why you effectively dismiss anything they have got to say." I must qualify this statement to their opinion. Late testimonies are the worst! Hearsay teases the movie plot mind with loose links to Manson and Aquino and Illuminati and crooked cops and none of it leads to solid evidence; but more frustratingly, further hearsay and suppositions are often the only thing we have to disqualify it. Family members in this case are probably all trying to be helpful but their presumptive amateur detective work sends everyone further afield. In defence of unreported stalker theories though none of these parents or younger siblings or husbands would have been likely to be aware of such activities. Any stalking with murderous intent that Zodiac may have done would surely be covert. I don't for example think that Zodiac would be arguing with a woman he intended to kill in a public parking lot just hours before making his move. As far as your reservations about crazy theories I would say you have always written as open-mindedly as you have cautiously, and I know a lot of people appreciate the fact-driven approach. Butterfield's work too has been invaluable for modern researchers as a machete to cut through the BS. Zodiac taps into something personal for everyone but once an investigator who publishes their work gets tunnel vision you can no longer rely on their presentation to do anything other than promote the validity of their theories.